In 4CHAMBERS there are four spaces that people enter and go through, like the flow of blood, in one direction, and come out on the other side, having had a deeper experience, hopefully, of their own humanity. 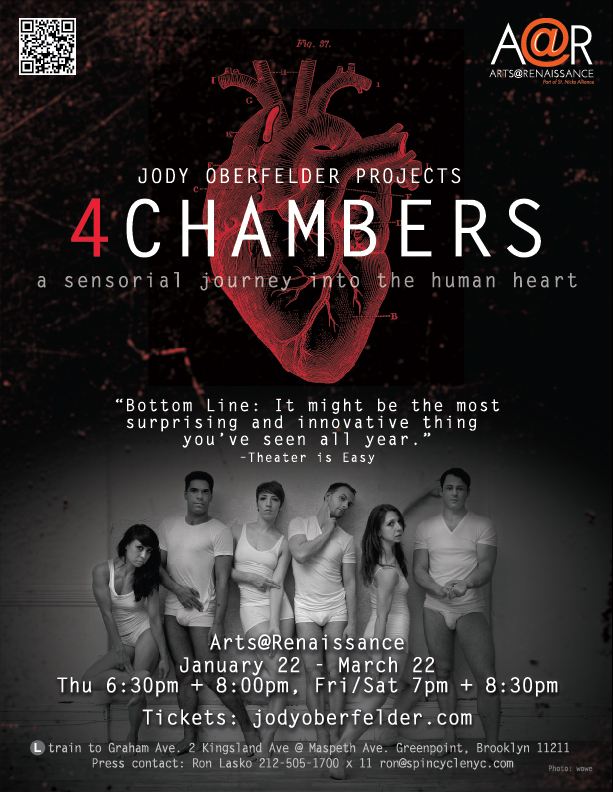 Last Saturday evening I experienced 4CHAMBERS (running Thurs., Fri., Sat., through March 22 at Arts@Renaissance, N.Y.C.) I spent the day apprehensive -- what might it be like to have a deeper experience of my self with a small group of strangers inside of a spacial representation of my heart? What does that even mean? And was this something I really wanted to do? Having spoken with the artist who conceived the project, director and choreographer, Jody Oberfelder, I knew 4CHAMBERS would challenge me. According to Oberfelder, this immersive theater piece differs from other such works because "the story you experience is your own." There is no narrative, or storyline, just your awareness of your interactions, reactions, proximity and connection to others. 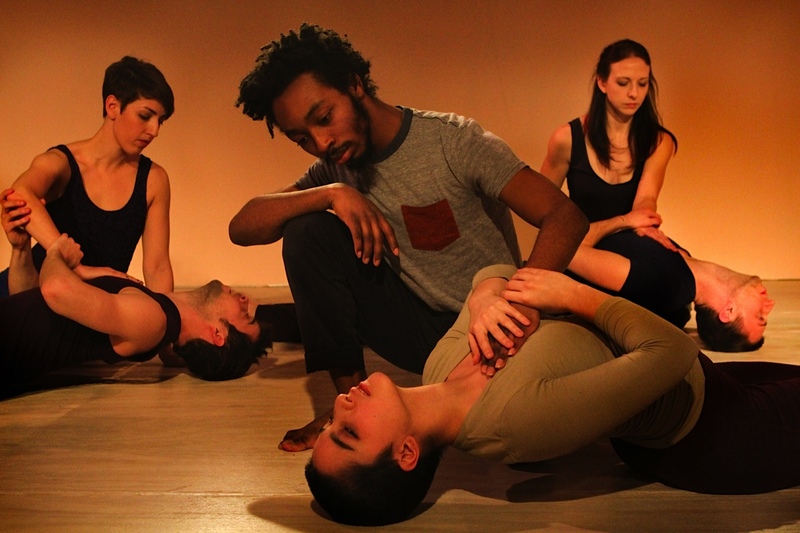 The dancer-docents lead you through the piece, continually reminding you, through movement and gentle, respectful touch that you are both inhabiting human bodies. This, I learned, is a powerful thing. With 4Chambers [I] use the heart as a metaphor to go inside people's bodies. To make them realize that they have a life that's encased by a body. It could also be because I'm getting older and it's an issue that I'm facing that this encasement of my life is not going to last forever -- [I want] to treasure it -- to treasure the motor that keeps me going -- the beat of my circulatory system that connects with my emotional state of being, and my brain, and how that filters down through my body. I want to help other people have that connection themselves. Oberfelder shared a story from one of the many medical practitioners and researchers she consulted while making this piece. Ideas for 4CHAMBERS -- came about in a conversation with a cardiologist, Dr. Holly Anderson, three years ago. When [Anderson] found out that I was a dancer, she was very excited to share that she tells all of her patients, post surgery,to put on music that they really love and move around to it -- ever so slowly - just to make their heart muscles move with happiness. Oberfelder, with her dancers and designers, has achieved a tricky, subtle balance of embodied human experience, science, psychology and playfulness. With all the potential to be overly sentimental, hippy-ish, and cliche, 4CHAMBERS is none of those things. It's a straight-shot of homo sapien sapien with a fine art chaser -- a brave and well crafted leap into the essence of sharing some of what it means to be human.